This week began the start of my final semester of graduate school also known as the reason for my silence as of late. Before class started back up again, I made sure to hit the thrifts, since I might not get much of a chance to do so for a while. On a visit to a Salvation Army, I spotted this gem while I was in line to check out. It was behind the jewelry counter and I am a bit ashamed to admit that I paid $30 at a thrift store for this needlepoint bag. I rationalized this purchase by convincing myself that I would have to pay this much or even more in a retail setting, so since it was just for me, it was worth it. What do you all think? I agree that $30 for a purse at the Salvation Army is kinda steep, but at the same time, it is a really nice bag in perfect condition. Would you pay that much for a bag at a thrift store? Am I crazy? hehe! Pretty! I say yes. If it is in beautiful shape - and it looks like it is - it's worth it. And you won't see everyone else with it. It's one of a kind. It is surprisingly high for a thrift store but if it were in an antique store, they might ask that. Or like you said a regular shop. That's a crazy price for a Salvation army shop, but it looks so nice and in good shape (as Eartha said). So, feel good. You have a very nice bag! Consider your purchase a "yea for you, you're almost done with grad school" gift! Congrats! 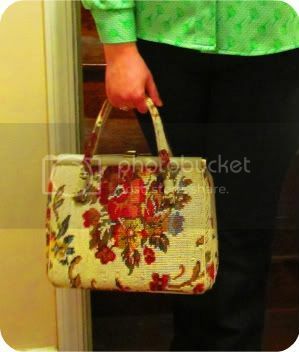 I would pay that much in an op shop/thrift store for something I love :) The bag is lovely and I can see why you bought it. Lovely find!